This new add-a-number pad is based on the principle of the Basil Horwitz Wallet and locks firmly using rare earth magnets. The instructions supplied include details of four stunning routines that you can perform with the Howitz Add-a-Number pad including a brilliant effect where a members of the audience are asked to write numbers on the pad and when written a fourth spectator is given the wallet and asked to add up all the numbers. The total arrived at, which could be 051206, is written up on a large white pad and shown to the audience who are asked to call out today's date. It just so happens to be the 5th of December 2006 and that is just what the sum total indicates 051206 (of course you modify the total for each performance so that it reflects the date of the actual performance. Another great routine starts when you hand a member of the audience a sealed paper bag with a big question mark on it. Once again the pad is passed around and the final spectator adds up the sum and calls out the total which the magician writes on a large sheet of white paper. The performer asks for someone in the audience with a mobile phone to phone the actual number now written on the large sheet of paper. He or she phones the number and a mobile phone can be heard ringing in the audience. It is the mobile phone which was in the sealed paper bag and when answered the two spectator find that they are speaking to each other. Full performing details of these effects plus others are provided in the comprehensive instructions supplied. 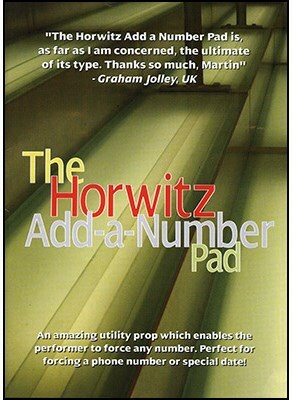 The Horwitz Add-a-Number Pad can be used without the physical intervention of the performer. The pad is passed from one spectator to the next and each is asked to write numbers in sum-form, and until the wallet is actually closed nothing happens. Once the wallet is closed the real numbers and the sum are exchanged for the fake sum which will add up to the number to be forced by the magician. The last but one spectator is asked to CLOSE the pad and then to throw it on to someone else in the audience. The very act of closing the wallet causes the magnets to lock and the next time the wallet is opened the sum facing the spectator is the forced sum and the real sum is tightly locked away. Credit for the creation of this brilliant pad should go to Tony Curtis in Thailand who makes the Horwitz Wallet for me and it is Tony who came up with the idea of using the same principle for the Horwitz Add-A-Number Pad. Thank you, Tony. Includes Leather Pad and Instructional Booklet.